Rotating, cropping, and re-sizing are three of the most basic, and easiest ways you can transform an image to make it match what you need from it. For the activities in this section, we will work with the image you can get from this link here, right click on the link and save it to your disk. When working with photographs, you will often come across ones where the photographer wasn't holding the camera perfectly level while they took the image. 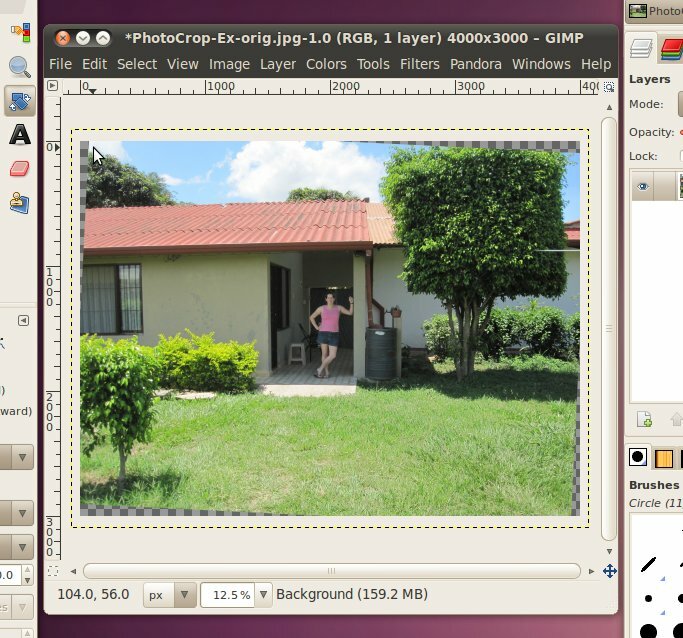 This is easy to correct in the GIMP by rotating the image back in to level. 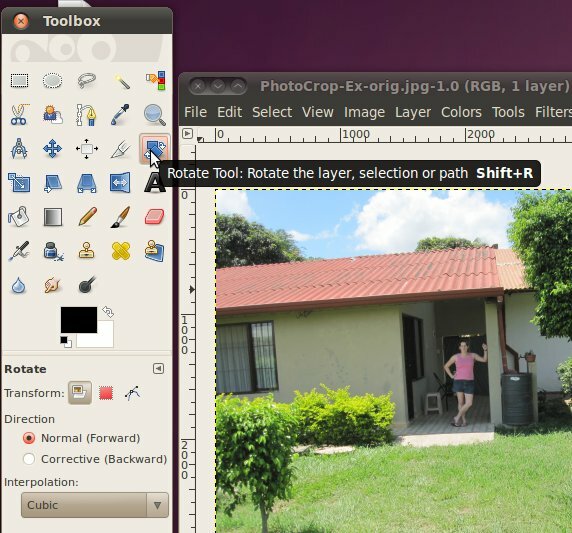 Once we have the image open, we will select the rotate tool from the toolbox. Once you are in the rotate tool, simply click on the picture and while you are still holding down the mouse button, move the mouse. This will spin the image around, just spin it to an orientation that looks correct. The post that the subject is leaning against should be vertical and the light/shadow line just under her should be horizontal, but it doesn't have to be exact, just close enough to look good. If it helps, you can use the zoom button at the bottom of the image window to zoom in closer on the subject. First, the word. In general the word to "crop" is used in all kinds of publishing, art, graphic design, photography, etc., it just means to cut the edges off of something. There are two main reasons to crop a photo. 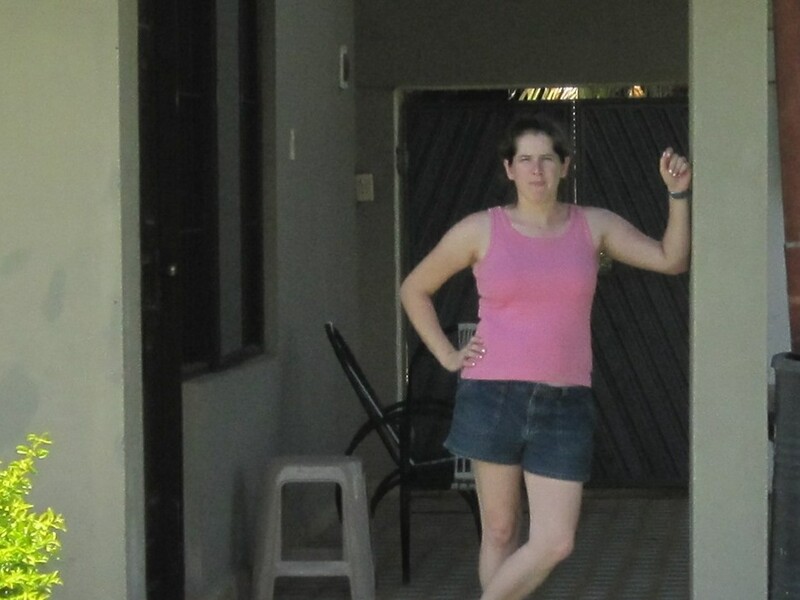 The first is the subject only takes up a small area of the photo. In this case, you can crop the photo down so that the subject is the majority of what is being shown. 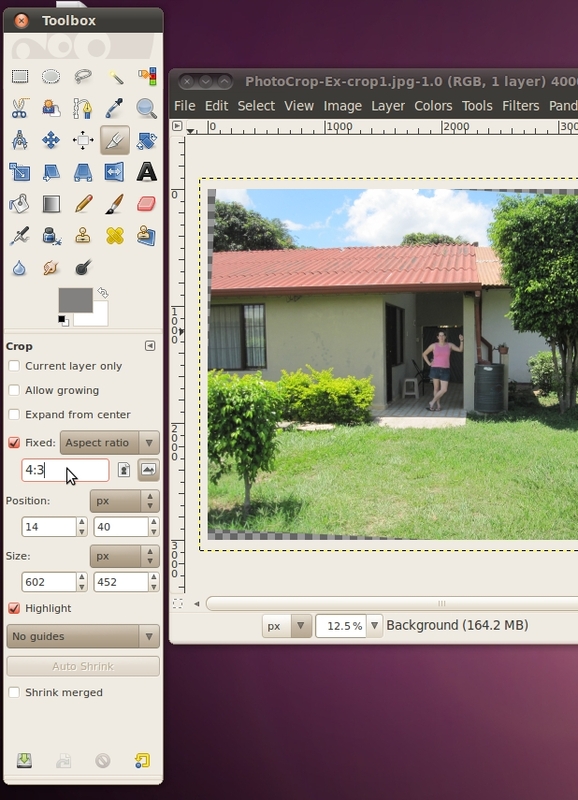 The second important reason to crop an image is to improve the spacing between various elements in the image. This is a little more complicated than the first reason. Most amateurs who take photos incorrectly believe that the picture will look the best when the subject of the image is directly in the center. However, over the years artists have figured out that this isn't correct. It is more pleasing to the human eye when subjects are 1/3 or 2/3 of the way across or down an image. Think of your image in terms of a grid. 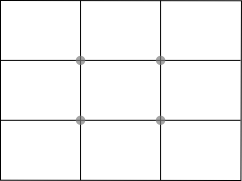 The ideal locations for a subject are at the intersections of the lines, represented on this diagram by gray dots. If that isn't possible, or feasible, then you can try to line up large features under the vertical and horizontal lines. It can often be tricky to figure out what are the subjects, or fit all the important features in a photo and still use the rule of thirds. Don't worry! This isn't an exact science, its just a good rule of thumb to keep in mind. For an example, there are two images below. The one on the left has the large rock outcrop centered in the middle of the image. The one on the right uses the rule of thirds to put the rock outcrop 1/3 of the way over from the left side. Additionally, the horizon (where the rocks meet the sky) is 1/3 of the way up from the top and the parallel clouds take up the top 1/3 of the image. You may notice that the one on the right feels somewhat more open, and less crowded. It is generally better to not have crowded photos. Additionally, notice that to get this less crowded feeling, the size of the features didn't have to be changed. The rock and the background are the same size in both images. We can go ahead and crop the picture down so that just the interesting stuff in the center around the subject is visible. Move the mouse to the upper-left corner of the area you want to be visible. Then click the mouse button, and while you are holding it down, move the mouse to the lower-right corner of the area you want. The GIMP darkens the area that will be cut-off, so that the clear area will be what remains after the crop. 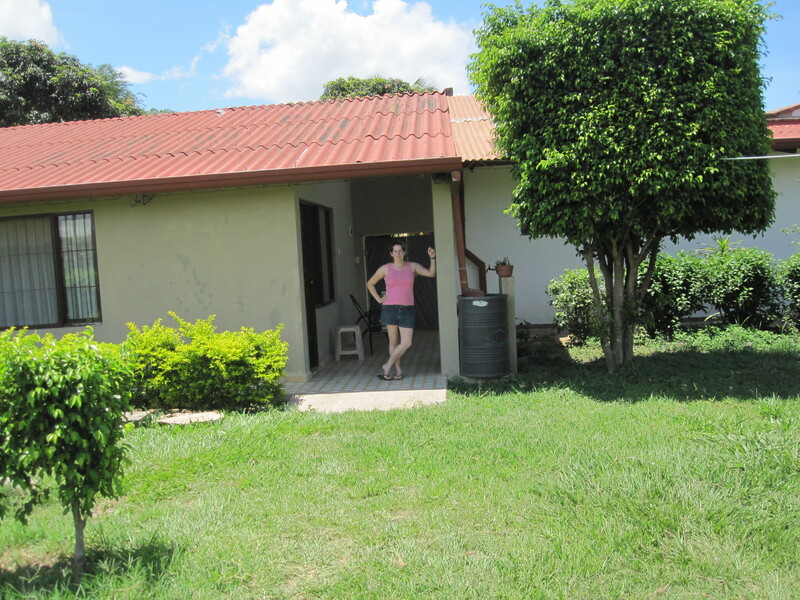 When you are happy with the area, let go of the mouse button. If you then decide you want to change the area some how, you can hover your mouse button over the area near the edges. It will pop up a box indicating that you are going to change that edge (works with corners also, then two edges will move). In the above example, I have the box up for the right edge of the crop area. To move this edge, just hold down the mouse button and move it until you are happy with the new area. When you are done click the mouse button once somewhere inside the clear area to complete the crop. But hang on, as was discussed previously, 4:3 is generally a good ratio for photographs, so it would be nice if the image we had when we were done was still 4:3. 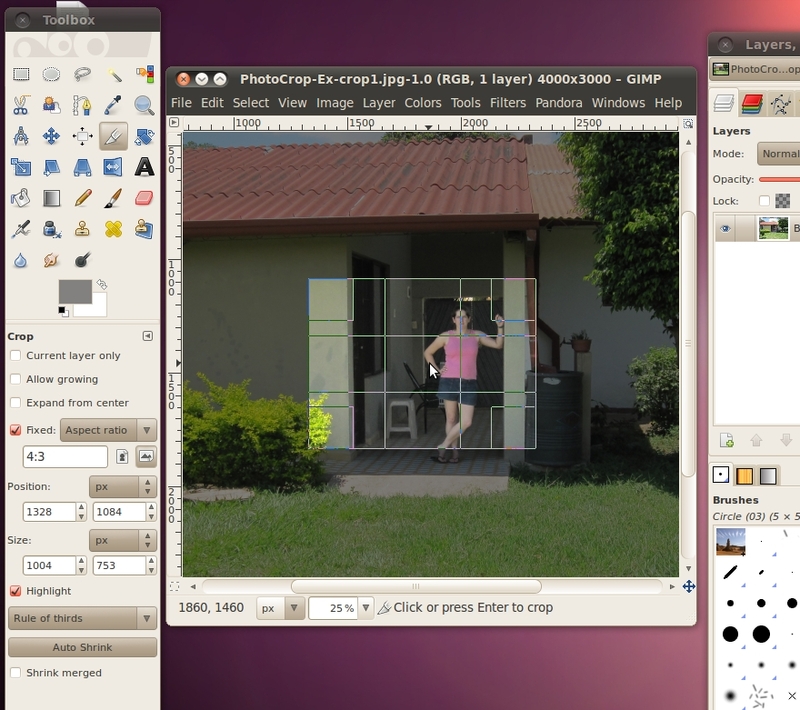 Luckily the GIMP crop tool has an option that can be set for just this purpose. We do this in the "Tool Options" dialog below the toolbox. 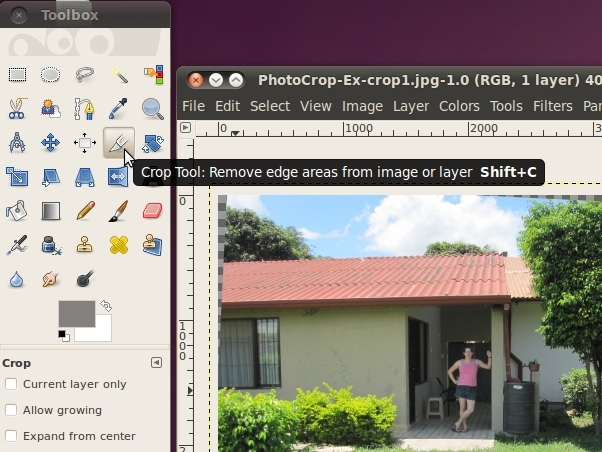 You may have noticed that when we selected the crop tool, this dialog automatically changed to the options for the crop tool. This will happen whenever you select a new tool, so that the options displayed here always match the tool you are working with. We're going to go ahead and check the box in front of "Fixed:" and select the "Aspect Ratio" option from the box. Then in the text field just below that line, we will put in the ratio of 4:3. Now, try cropping the image again, to get back to the image one step before hit the buttons "Ctrl" + "z" one time to undo your previous crop. (You can also do this in the menu Edit->Undo Crop Image) You notice that when you move your mouse to select the area that will be kept, the box is a bit more rigid. With the fixed aspect ratio, it is not possible to increase one of the sides without increasing one of the adjacent ones. Alright, now we're set for our final try at cropping. If you currently have an already cropped image on your screen, hit Ctrl+Z until you get back to the image you had after you rotated it. 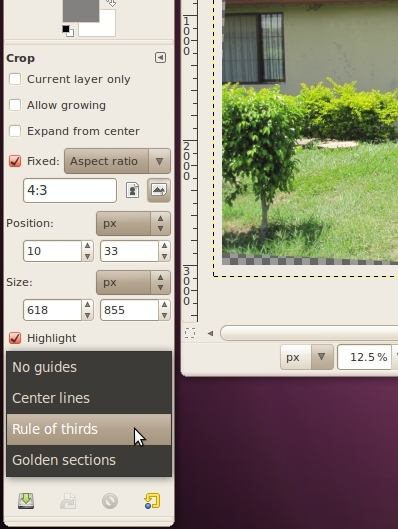 Now select an area that has the subject occupying a large part of the area, is in 4:3 ratio, and uses the rule of thirds and crop it! You may have noticed that the image that we just finished with took up most of your browser window, even after we cropped off a huge part of it. Since digital cameras these days are capable of taking such large, high-resolution pictures, this is a fairly common problem when pictures are used on the web. It is possible to have the site tell the web browser to shrink the picture and not display it at full size, but then you still have to transfer the whole picture. Because the picture is so big, it has to store all those pixels, and the file size is also big. The above image is 131KB, which isn't huge, but it can make the site slow to load, especially if you have lots of pictures like that. Instead, what should be done, is the image should be re-sized down to be the correct size for displaying. Changing the size in this manner will not change what it looks like on the web site (if displayed at the same resolution). This is different from using the quality selector when saving the image, as that does change how the image looks (just hopefully not so the eye can make it out). A quick note, there is almost never a good reason to re-size a picture to something larger. When you make it smaller, the program doing the shrinking can easily take out pixels to make it the correct size. However, if you were to try to make it larger, it doesn't know what the pixels in between the current pixels should be to add in. So what it does is it just guesses, based on what pixels are around it. This will indeed make it larger, but will also increase the file size of the image. If you want a larger image on your web site, that is when it is better for the site to tell the web browser how big the image should be. 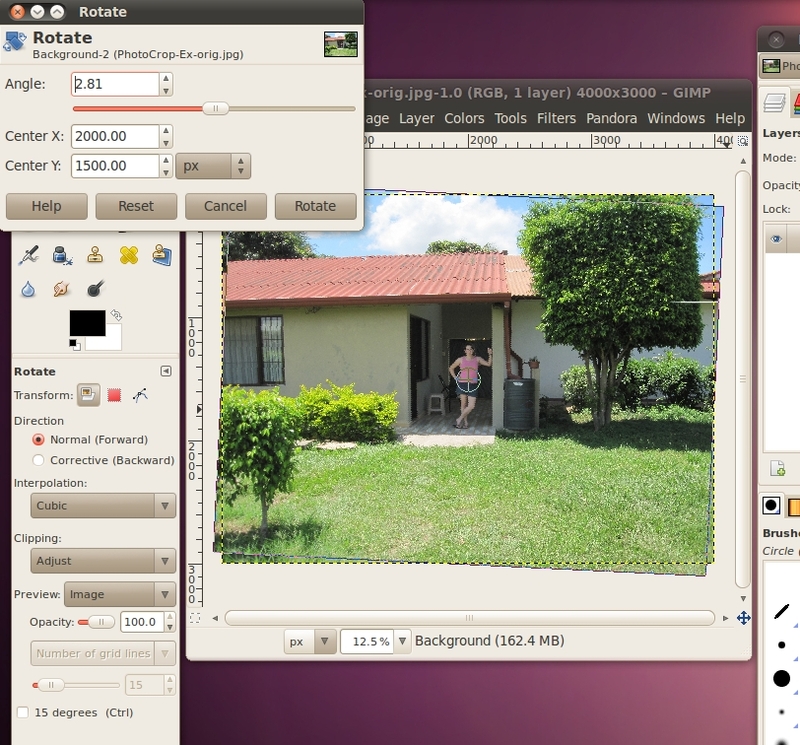 Re-sizing in the GIMP is easy. Just go to Image -> Scale Image. You will see the Scale Image dialog on the screen. 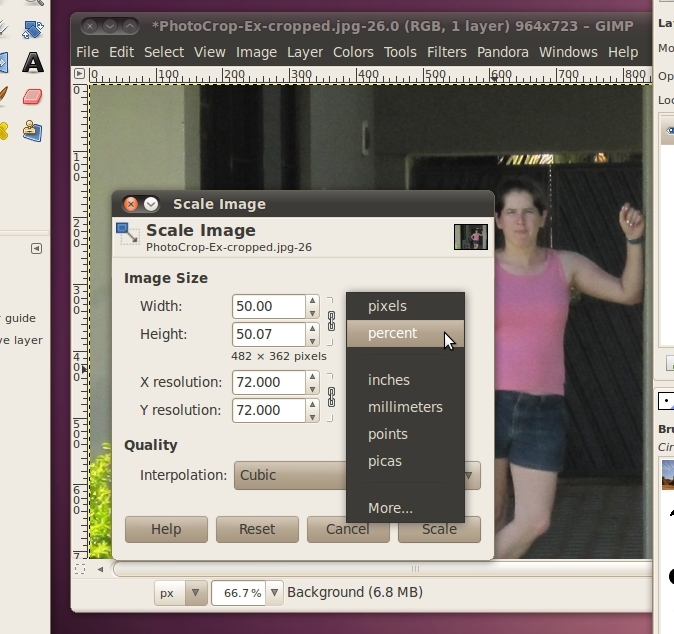 Now you can input the size you want for an image. If you have a web site, you may already know exactly how many pixels you want the image to be. To do this, you can select "pixels" in the first drop down box, then put the number of pixels you want for the width or height. 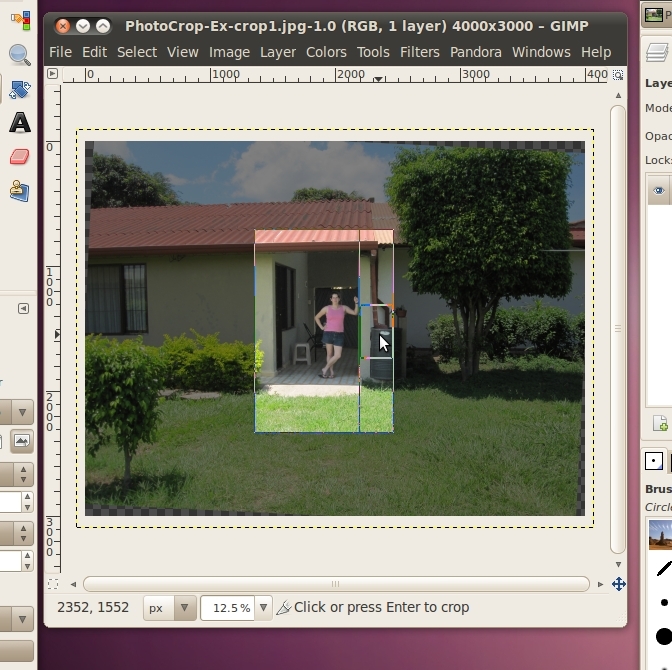 You only have to put one of the values in, and the GIMP will automatically calculate the other. It is possible to change them independently (by clicking the little chain between them to un-link them), but this should almost never be done because it will cause the image to distort and make it look stretched out. If you don't already know the exact dimensions you need your image to be, it is generally easier to re-size it to a percentage of the original. To do this select "percent" from the first drop down box, then enter your best get at what percent of the original you want your new image to be. If you're happy with your image, you can go ahead and save it. If you're trying to make it small for a web site, don't forget to adjust the quality selector to make it as small as you can. After all that rotating, cropping, and re-sizing, here's the final image. Its only 24KB, when we started with a 3900KB original!